Check our Online Store for these great buys: T-Shirts, Stickers, & Compact Discs. After releasing one of the best (and perhaps most overlooked) reggae albums of 2005, JohnStone seeks to make a big splash with the follow-up, seeking the aid of Bambu Station lead singer and all-around musical magician Jalani Horton in recording Innocent Children. Not that they needed the magic touch that the Virgin Islands has produced reggae-wise over the past several years, but recording in that inspirational land certainly didn't hurt. Listening to Innocent Children is like stepping into a time machine and transporting yourself back to the age of classic roots harmony. "Peace and Love and Harmony" and "Clinton's Lament" in particular recall the heyday of Israel Vibration, with rich, layered vocals and a laid-back, rural vibe. The instrumentation is likewise lovely; we get a couple of nice dubs (aided by the mixing of veteran Jim Fox, who has worked with -- you guessed it -- Israel Vibration), plus extended musical riffs such as the jazzy saxophone intro to "Black Spirits Swells." As the name indicates, Innocent Children is topical -- the title track inspired by a news report of children recruited to fight in Haiti -- and often mournful, but the tender "Your Love" and "Doubt" showcase the group's lovers side in fine style. JohnStone is a sure cure for reggae fans lamenting that the music isn't what it used to be. Those of you who didn't pick up their debut should not miss this train again. Buy a ticket for a marvelous ride at johnstonemusic.com. I raved about the debut album by Washington DC-based reggae band JohnStone, and for good reason. Eyes Open was a great release with seemingly limitless staying power: I found myself listening to it repeatedly while other reggae CDs on my shelf gathered dust.The group's follow-up, Innocent Children, likewise proves a keeper worth revisiting. Produced with assistance by R. Jalani Horton from noted Virgin Islands reggae outfit Bambu Station, Innocent Children finds JohnStone in a noticeably more serious, almost brooding vibe compared with Eyes Open. Saxophonist Benjamin Crandall, upgraded from guest player to full-time member, colors many of the tracks with moody, jazz-laced solos, and the songs themselves are as pensive as they are grooving.The title track addresses the evils of children being conscripted into military service, while "Trod your Own," "Doubt" and "Wanted" sing of personal struggles and the strength to carry on through them. Even the relative rays of sunshine ("Keep Climbing," "Happy Day") are textured with cautionary tones that get to the heart of you even as your head bobs to the beat.But lest I mislead anyone, let me state unequivocally that this album is not a downer by any means. 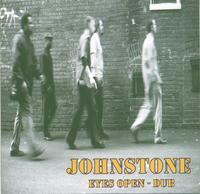 JohnStone proved with their last disc and this one that their music is as consciously edifying as reggae gets. Their instrumental chops are full of nimble expertise, the shared lead vocals of guitarist Andre White and drummer Alfred Adams brim with no-nonsense conviction and when all's said and done, you'll forget your troubles and dance. Just be sure to cool down and take the advice of the concluding "Be Thankful," a Ben Harper-ish acoustic piece that lays it all on the table. The Washington, DC area is one of the best places in the US if you're a reggae fan, with acts like Midnite, Soldiers of Jah Army, Carlton Livingston, and Shango Band having taken up residence there at one point or another, not to mention RAS Records, Mt. Nebo Records, and Lion & Fox Studios. Well, add the band JohnStone to that list. 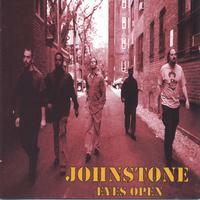 An active member of the DC reggae scene for several years now, JohnStone spent the past three recording Eyes Open, and the time was well spent. The care and attention spent is evident in this top-notch showcase of roots reggae. The international lineup -- including members from Jamaica, Guyana, Ghana, and the US -- blend their respective homeland's influences beautifully, performing roots with touches of soul and occasionally a more up-tempo African twist (as on "The Awakening" and "Celebration"). Lead singer Andre White's vocals are evocative -- a folksy blend of Alpha Blondy and Winston Matthews of Wailing Souls fame -- and the music is rich and heartfelt, with nary a weak track to be found. Check 'em out at johnstonereggae.com. The already-strong USA reggae scene gets another big boost here. Washington, DC-based johnstone play tight, uplifting modern roots that's rich with pop hooks and anthemic lyrics that carry the social conscience which has recently found itself at the forefront of reggae again. This biracial band has got their chops down, too. Live bass and drums form a solid riddim backbone that's expertly topped by stinging keyboard and guitar riffs and seasoned with dashes of percussion and saxophone. Guitarist Andre N. White and drummer Alfred Adams handle the bulk of the lead vocals and songwriting, displaying an assured sense of both on songs that stress basic goodness ("Awakening," "Never Ever"), embrace the spirit ("Shine") and seek unity in the groove ("Celebration"). The tracks are finely crafted, full of rich instrumental layering and vocal harmony gracing the reggae foundation. [Buy Eyes Open and Eyes Open Dub].